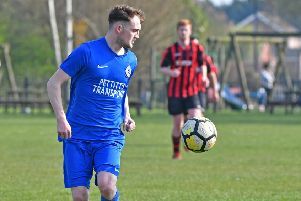 Gary Edgley was left feeling proud of his Boston Town squad, despite the Poachers suffering back-to-back defeats for the first time in 2019. Third-place Rugby Town left the DWB Stadium with a 2-1 victory on Saturday, seven days after leaders Daventry edged out Boston 1-0. But Edgley was refusing to feel down, buoyed by the never-say-die attitude of his injury-hit squad. “I’m sure people are getting bored of hearing me harping on about it, but we’ve had a massive injury list,” Edgley said. “It’s typical of this season, every time we play a top-six side we have a load of injuries. That’s 100 per cent fact. After going a goal down, Danny Horton drew the Poachers level, only for Rugby to seal victory in the second half. “We took it to Rugby, especially in the first half hour,” Edgley added. “We made three subs - two of those because of injuries - before ending the game with 10 men due to another injury. Rugby and Daventry may have claimed the points, but Edgley has used the matches as markers to see how his young side compare to the United Counties League Premier Division’s best sides. “We knew these matches would be difficult and a test of where we are,” he added. “But I was really proud of how the lads played and how they gave it a go. “Rugby are a physical side. They tried to bully us and, in fairness, they did that well.